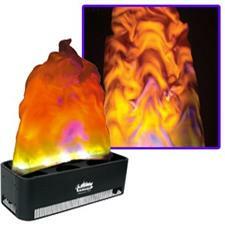 Giant, simulated flame effect that produces a realistic towering blaze with no heat! Very portable and easy to transport�Great for night clubs, Mobile DJs, stage productions, schools, back yard parties or anywhere an open flame is prohibited Amaze your patrons at your next gig with this fantastic effect without the danger of real fire. Convenient On/Off switch on rear. Lamps: 4x LL-MR16O 12V, 35W (Orange) & 2x MR16B 12V, 35W Dimensions (LxWxH - base only): 9.75"x 24"x 8.5" / 248x610x216mm Weight: 17 lbs. / 8 kgs. Weight: 17 lbs. / 8 kgs.